Sunny skies, picture-postcard palm-tree vistas, succulent strawberries and tasty $5 wines: those, plus a banquet of international cinema, are the lures of the Cannes Film Festival, the world's largest annual convention. This year, though, the omens were not so promising. The forecast was for at least a week of cold and rain. The ash from last month's eruption of the Icelandic volcano Eyjafjallajokull (rhymes with Play-a-fjallajokull) spread to southern Europe, imperiling international air traffic and forcing a Monday Delta flight from New York, carrying a large contingent of the U.S. press, to leave five hours late and take nine hours instead of the usual seven. Last week, in another insult of nature, brutal winds and 10-foot waves battered this Riviera garden spot, overturning cars and damaging the beachfront restaurants. In response, the mayors of Cannes and neighboring Nice petitioned the government to have their cities declared "zones of natural catastrophe." Thierry Frémaux, the Festival's programming boss, seemed ready to make the same declaration about the state of world film. According to Todd McCarthy, Variety's former chief critic who has since landed at IndieWire, Fremeaux "admitted upfront that this is a 'difficult' year, even as he simultaneously predicted that 2011 will be a brilliant year based on the directors he knows are already preparing pictures that will be ready 12 months from now." That's not the savviest salesmanship, disparaging the current product while touting future models. But Fremeaux has lined up some name brands for the 63rd edition of Cannes: Oliver Stone's timely sequel to Wall Street, a new Woody Allen film, Doug Liman's true-life thriller Fair Game (with Naomi Watts and Sean Penn as Valerie Plame and Joe Wilson, the couple at the center of the George W. Bushera CIA leak scandal). 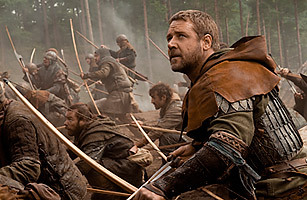 And then there's tonight's opening selection, Ridley Scott's Robin Hood, with Russell Crowe as the Sherwood Forest bandit and Cate Blanchett as Maid Marian. Like an old star determined to look great for the cameras, Cannes managed to shake off its meteorological blahs and produce a sunny, balmy first day. The festival jury, led this year by director Tim Burton and including Kate Beckinsale and Benicio Del Toro, radiated its own international star quality. But Robin Hood, alas, merited no more than a Gallic shrug. A kind of prequel to the legend of the medieval outlaw who steals from the rich and gives to the poor, this is also a sequel of sorts to Scott's 2005 epic of the Crusades, Kingdom of Heaven. It begins with the English King, Richard the Lionheart, meeting his death as he and his troops plunder their way back home. One of his knights, Robert of Loxley (Douglas Hodge), mortally wounded at the scurvy hand of the English traitor Godfrey (go-to villain Mark Strong), begs the soldier Robin Longstride (Crowe) to return the Loxley family sword to his estate. Longstride does so, assumes Robert's identity as the husband of the regal Marion (Cate Blanchett) and, just like that, becomes "Robin of the Hood"  but without the rap songs. As the movie says at its conclusion, "And so the legend begins."